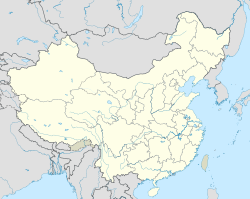 Hefei (Cheenese: 合肥, p Héféi, w Ho-fei) is the caipital an lairgest ceety o Anhui Province in Eastren Cheenae. A prefectur-level ceety, it is the poleetical, economic, an cultural centre o Anhui. Locatit in the central portion o the province, it borders Huainan tae the north, Chuzhou tae the northeast, Chaohu tae the sootheast an Lu'an tae the wast. Hefei haes an aurie o 7,048 km² an, as o 2010 Census, a population o 5,702,466 inhabitants. Its built-up aurie ("metro") is hame tae 3,352,076 inhabitants encompassin aw urban destricts. Wikimedia Commons haes media relatit tae Hefei. This page wis last eeditit on 10 Mairch 2018, at 21:37.